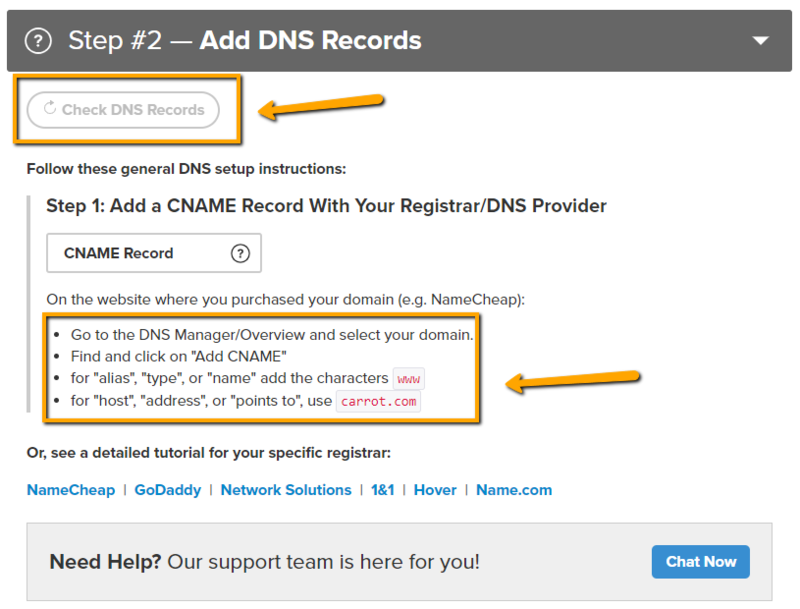 In this tutorial, we’re going to show you how to attach your custom domain to your Carrot site! Attaching your domain to your site is one of the most important things you’ll do since it’s what actually makes your site viewable to the public. You can have your domain be whatever you want, as long as you own that domain! If you’re looking for a site to purchase your domain at, we strongly recommend Namecheap since they’re easy to work with, and they don’t try to upsell you like crazy! Want us to do it for you? Please scroll to the end of this tutorial and complete the form to get started. You’ll want to login to your registrar, where you purchased your domain, to update the settings. The second box, shown below, are the DNS settings you are looking to update.